Felt Christmas Crafts & Mini Holiday Quilt Kits! You'll find a variety of Christmas craft kits in the Seasonal & Holiday Kits section of the store and we have some new product arrivals you won't want to miss! There's still plenty of time to make a felt Christmas stocking for a loved one this holiday season! Choose your favorite stocking kit design from a variety of holiday themes. 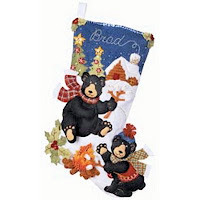 This is a fun stocking design featuring two friendly black bears roasting marshmallows over a bonfire in the snow! Creative details add the finishing touches to this outdoorsy scene, including decorated Christmas trees, a snow-covered cabin, and holly sprigs with berries. Bucilla felt Christmas stocking kits include stamped felts, cotton floss, sequins, beads, needles, and easy to follow instructions. 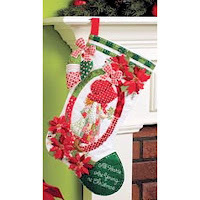 This modern felt applique stocking features classic country Christmas colors, plaid bows, pretty poinsettias, and Holly Hobbie dressed for the holidays. 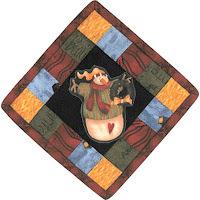 Felt applique craft kits make it easy to create a lasting keepsake for the holidays. Your completed stocking will become a family favorite to be enjoyed every season! And, don't miss the Victorian House Felt Christmas Stocking Kit with Lights. A string of 20 clear lights is included for extra holiday sparkle! 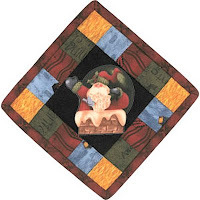 Decorate your home for the holidays with mini Christmas quilt kits! You can make these mini magnet quilts in just 2 hours! Mini quilt kits from Quilt in a Day are a quick & easy quilting project for the holidays. Make them up as ready-to-give gifts for family and friends. These complete quilt kits include pre-cut fabric strips, a fussy cut picture, backing, binding, batting, and detailed instructions. Each kit also includes a magnet for easy display on any metal surface. Decorate your kitchen refrigerator with mini quilts! The finished size will be approx. 7" square. Mini quilts are an ideal quilt kit for beginners to learn to quilt & sew. These little quilt kits are perfect for teaching children or adults how to sew. They're also perfect for family craft time. Everyone can choose their favorite design to create. There are more designs to choose from in the store - make sure to see them all! Holiday crafts are fun to make and give! You'll find a variety of Easy Christmas Craft Kits in the Seasonal & Holiday Kits section of the store. Visit Weekend Kits to see our full selection of creative project kits and be ready to create something new for the holidays on your next Weekend at Home! Latch Hook Rug Kits are Creative, Easy & Fun! We've added 4 colorful kits to our new Latch Hook Kits section. Latch hooking is a fun craft for everyone and kits make it easy for beginners to get started! You'll enjoy our new latch hook kits from Caron International, a trusted brand known for quality yarn and latch hooking products. Latch hook rugs can be transformed into fluffy throw pillows and colorful wallhangings to decorate your home! 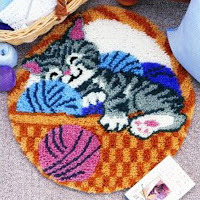 The Cat Nap rug hooking kit features a sweet tabby cat napping in a basket of yarn. This WonderArt latch hook kit includes color coded canvas, pre-cut rug yarn, easy to follow chart, and complete illustrated instructions. The finished size of this rug is 24" round. Caron latch hook kits are easy to complete and ideal for beginners wanting to learn how to latch hook. Basic latch hooking instructions are provided in every kit. This Natura latch hook rug kit from Caron is a quick and easy latch hook project. The finished size of this rug is 12" x 12". You can make a soft & fluffy pillow with your completed rug. This teddy bear pillow would be a wonderful addition to any baby's nursery or young child's room! Make a latch hook rug especially for the holiday season! 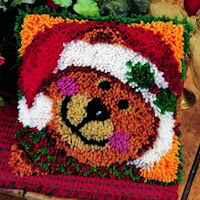 The Jingle Bear Latch Hook Kit is a quick & easy WonderArt rug hooking kit. Decorating for the holiday is fun with these colorful latch kits. Latch hooking is a relaxing craft you can do at night while watching your favorite television show. Make up some hot tea or chocolate and start latch hooking! This is a modern latch hooking project for you to create a colorful wallhanging for the holidays. These adorable Snow Friends are sure to bring a smile to everyone! Latch hook rug kits are available in a variety of styles and sizes. 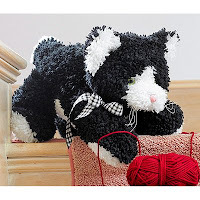 We'll be adding new kits to our Latch Hook Kits section, so be sure to check back often to see what's new. Visit Weekend Kits and get ready to start latch hooking on your next Weekend at Home! New Stuffed Animal Latch Hook Kits! 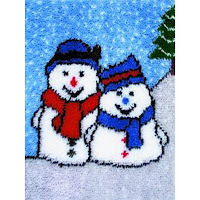 There's a new Latch Hook Kits category at Weekend Kits! Latch hooking is an easy craft to learn and latch hook rug kits make it so easy to get started. You'll find a fun variety of latch kits, including kits to make these adorable stuffed animal toys. These latch hook "Huggables" are perfect for gift giving this holiday season! Make a soft & fluffy stuffed animal with one of these do-it-yourself latch hook kits from MCG Textiles. It's easy to see why they're called Huggables! You can make this cuddly teddy bear! 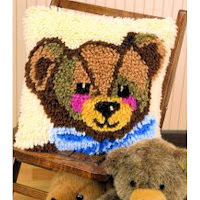 This latch hook kit includes 3.75-mesh canvas, 100% acrylic pre-cut rug yarn, ribbon, eyes, chart and complete assembly instructions. You'll need a latch hook tool to complete these rug hooking projects. Latch hooks are available in the store and can be easily added to any latch hook kit order. The finished size of your bear will be approx. 14" in length. 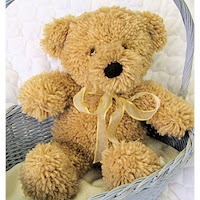 This soft bear would be a wonderful gift to give any young child this holiday season! You'll have fun making this soft playful kitty! The finished size of your kitty will be approx. 12" long. It's OK if you've never tried latch hooking before because these kits include easy to follow how-to instructions. You'll learn how to use your latch hook and how to read the color charts. 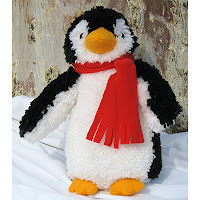 This sweet Huggables Penguin is wearing a red felt scarf and ready to play in the snow! You'll need to have stuffing material on hand when you start the assembly portion of this project. Latch hooking is a fun craft activity for everyone! It's a creative way to spend a cold winter afternoon. Make some hot chocolate and have a latch hooking party! You'll find a wide variety of creative craft kits to explore at Weekend Kits. Make sure to visit the new Latch Hook Kits section to see all of our latch hook rug kits and get ready to start latch hooking on your next Weekend at Home! Kid's Fleece Craft Kits - Knot A Quilt & Scarf! We've added to the Kid's Craft Kits section of the store with 3 new craft activity kits for kids! 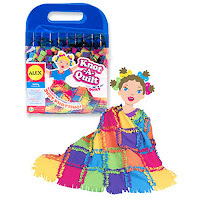 The Knot-A-Quilt Kit from Alex is a super easy craft for kids to make a soft fleece quilt. This quilting activity kit includes 48 squares of fringed fleece fabric in 6 bright colors. Kid's will knot the precut fringed squares together into a colorful quilt pattern. There's no sewing or stuffing required for kids to make this soft and fluffy patchwork blanket. Once they learn how to knot the squares together, they will be able to complete this quilt project all by themselves! Their finished quilt will be approx. 36" x 48". 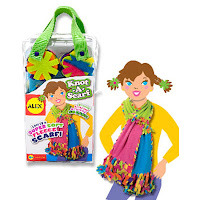 The Knot-A-Scarf Kit is a fun fleece activity for kids to make a soft and colorful scarf. This easy craft kit includes 4 fleece scarf bands, lots of fleece flowers and fringe, plastic needle, and easy instructions. Kid's will knot and lace together the precut fleece fabric pieces. There's no knitting or sewing required! These fleece knotting projects are recommended for children 6 years and above. The Alex website provides an excellent instructional video showing the knotting technique being demonstrated and there are plenty of helpful tips provided throughout. You can view the video by going to the Product Instructions page, finding Knot A Quilt in the list of product names, and clicking on the "Watch Video" icon. 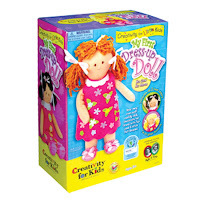 The My First Dress-Up Doll Kit from Creativity for Kids is a fun craft kit for small children, 3 years and above, to make their own soft doll. This kit includes a 13" plush doll, felt dress with matching bloomers, pink slippers, peel & stick felt shapes, "Designed by" clothing tag, and 14 yards each of black, auburn, and blonde yarn. Little kids will enjoy decorating their doll's dress with the colorful felt shapes. Then, they will choose their doll's hair color from the 3 yarn colors provided. You simply tie the hair in place with ribbons - no sewing and no mess! Make sure to visit the Kid's Craft Kits section to see our complete selection of craft kits for kids. After finding kits for the kids, explore all of the other creative kit categories at Weekend Kits and be ready for family craft time on your next Weekend at Home!